Walt Disney World is a treasure trove of photographic opportunities. Themed amusement parks, award-winning resorts, each with a different architectural flair, and miles of beautiful flowers and lush tropical landscaping all add up to unlimited chances to bring home pictorial memories. Long after the sweet taste of your last Mickey Mouse ice cream bar has faded, a picture can bring you right back to that moment…photographic deja vu. Once you’ve been to Disney World, there are certain iconic images that stay with you forever. Construction started on Cinderella castle in 1969 along with Main Street, U.S.A., after years of research, planning, and design. Jeff Kurtti outlines in his book Since the World Began how Disney legend Herbert Ryman started plans for the castle with a charcoal sketch, which he developed into a famous and now frequently-published painting. Ryman was inspired by several French castles with notable titles such as Chambord, Usse, and Chenonceau, plus the Disney classic film Cinderella. 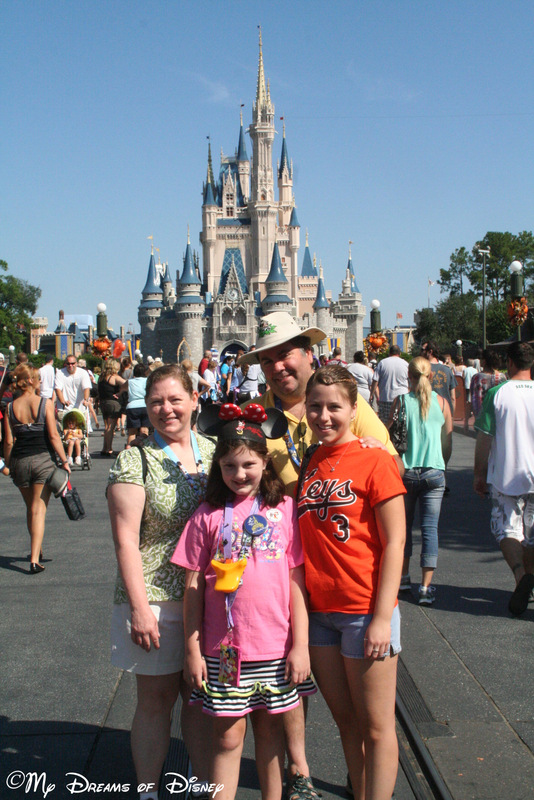 Picture this…Cinderella Castle took over 18 months to build from start to finish. Most of the work was completed by WED engineers and artists using 600 tons of steel in the framework. Imagineers designed the interior and exterior walls to resemble granite. And on a humorous note, Kurtti reports that contrary to popular myth, Cinderella Castle can not be dismantled in case of a Florida hurricane. The image of Cinderella Castle remains with us. The photograph above is the castle during the Christmas holidays when she is at her twinkling and shining brightest. There is hardly a bad angle to be seen…grab your camera. Thanks for coming along for a photographic ride! Amanda M.is an admirer of Disney architecture and design and an award-winning amateur photographer. You can see her Disney photographs on Facebook at Mouze Kateerz, or visit her blog created by My Dreams of Disney’s own Mike Ellis at mouzekateerz.com. Do you have a favorite iconic Disney photograph you’d like to share with our readers? E-mail it to Amanda at mouzekaterz@gmail.com. Cindy, Sophie, Stephanie, and myself at our favorite park! This weeks Wordless Wednesday is themed “First Footing, Disney Style.” In this theme, Deb is looking for the first park that you would first step foot in when you visit Disney. By tradition, this will bring luck to the home (or in this case, theme park) that you visit. So which park would be your first to visit? As always, the Wordless Wednesday Blog Hop is being hosted over at Focused on the Magic. Thanks Deb for hosting this! If you would like to see the rest of the entries, just click on the button!